Huda TV’s “Lifting the Fog” (2005), Episode #9: Misguided and dangerous speech about groups and sects in Islam, like: Groups who take their names from Quranic passages are obviously authentic. 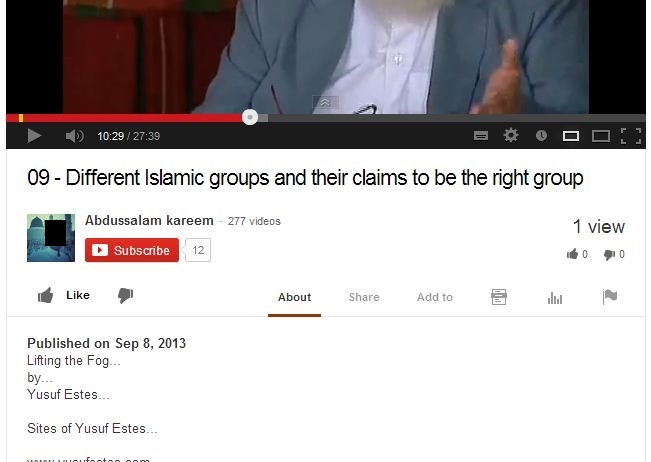 The serious errors in this video have been previously clarified here. 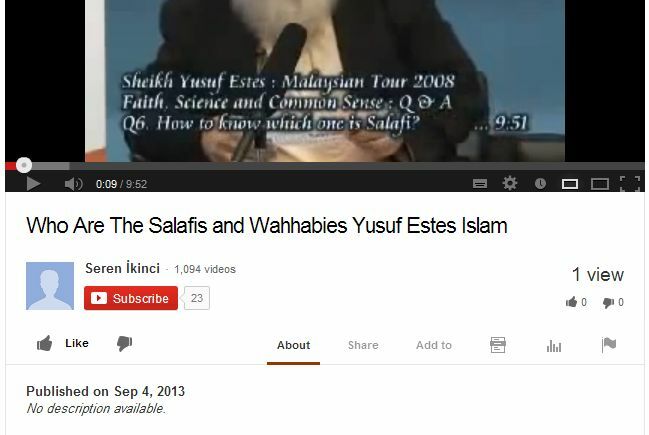 Malaysian Tour (2008), Q&A About Salafis: This is the infamous 10-minute disaster when Yusuf Estes slandered Shaykh Al-Albaanee, claimed that Salafiyyah was an invented and invalid ascrption, and promoted the heretical Iranian Ja’fari Shia Math-hab as a legitimate math-hab, like the well-known four! The serious errors in this video have been previously clarified here and here. 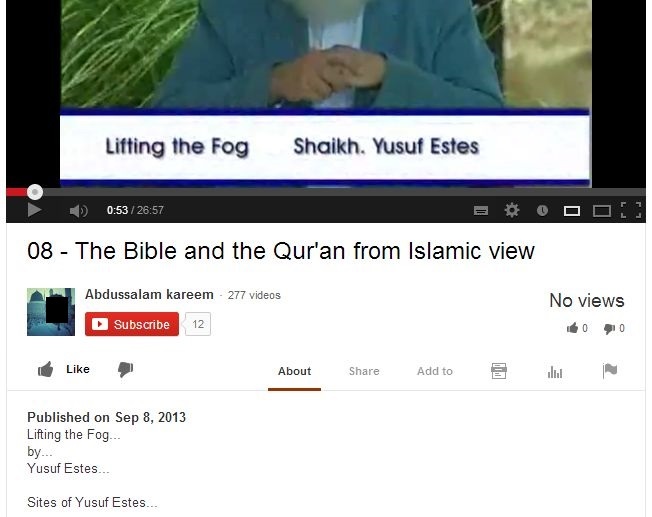 Huda TV’s “Lifting the Fog” (2005), Episode #8: Major calamities of the Jahmiyyah about the Quran not being a book, the mus-haf not being Quran, the mus-haf being a “representation” of the Quran, the filthy tash-beeh of saying that the Quran resembles paper money, the claim that Allah has not preserved the Quran in written format, etc. Huda TV’s “Beauties of Islam” (2008) #31: More Jahmiyyah filth about the Quran not being a book that we have and the mus-haf not being the Quran. 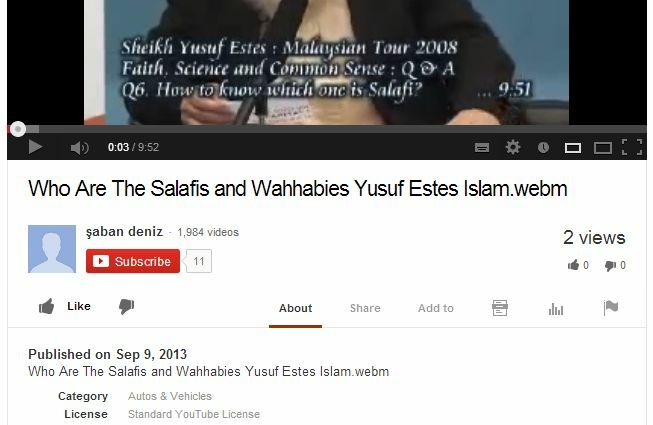 Malaysian Tour (2008), Q&A About Salafis: Attacks Islam’s scholars, dismisses “Salafiyyah”, and legitimizes the Shiite “Ja’fari” Math-hab. Refer to #2 above. 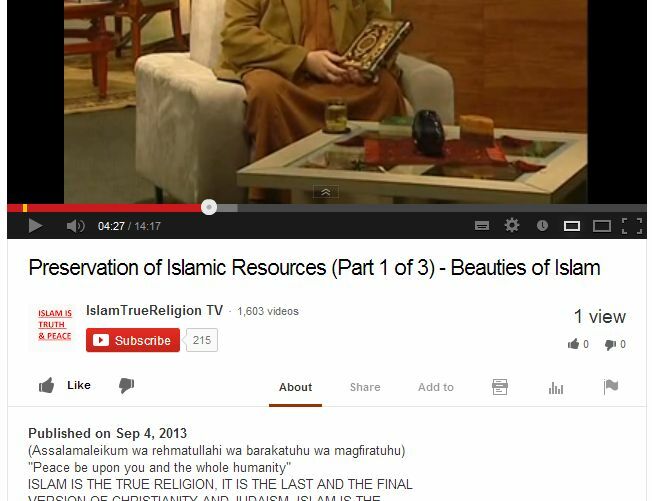 Huda TV’s “Beauties of Islam” (2008) #31: Same Jahmiyyah filth, see #5 above. So here you have seven more re-uploads of Jahmiyyah calamities, filthy tash-beeh, promotion of the Shiite Religion, and the George Bush Jihad folly. In one typical week on YouTube seven more disastrous crimes against the Religion of Islam, seven more videos that bring anguish to the hearts of concerned Muslims everywhere. 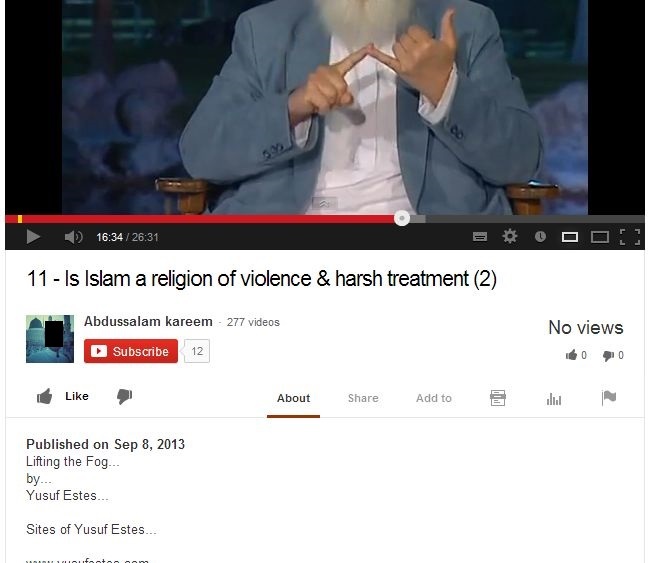 If you think everyone already knows about the dangerous teachings of Yusuf Estes and the clarifications on this website are not needed and perhaps excessive, then you obviously need to think again. 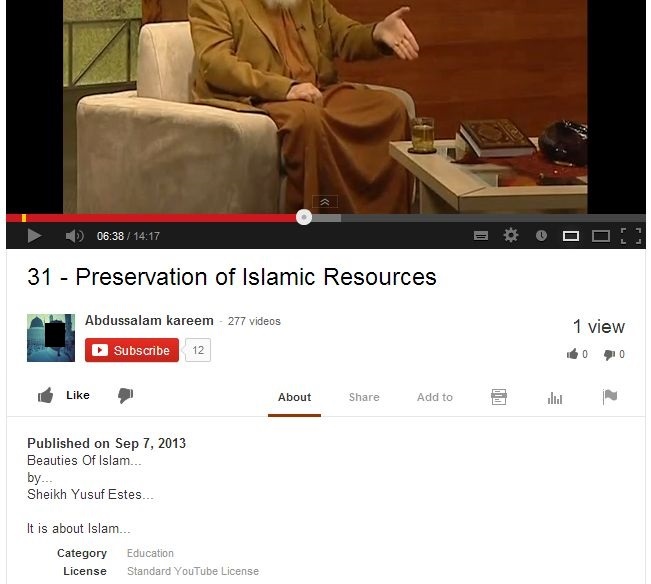 If you believe that Yusuf Estes has already repented, check your sources and verify that claim. If you find a real retraction of any of his errors, please inform us and we will publish it here for our visitors. Obviously, based on the above, people around the world need to be informed! We ask Allah to aid us in preventing the spread of these corrupt teachings and in warning against them. May He raise the rank of His Prophet Muhammad and grant him peace. And Allah knows best. I used to support Estes and defend him. I used to ask him questions by email. I swear by Allah he knows he is wrong in all these issues, but he hides the truth to preserve his reputation. I happen to know that his personal income is almost entirely based on his reputation and the financial support he receives because of it, and he fears the loss of income if he admits to his errors and clarifies them. This is not the way of a sincere preacher ever. To me, he is selling his Deen out for dunya. I ask Allah to guide him.